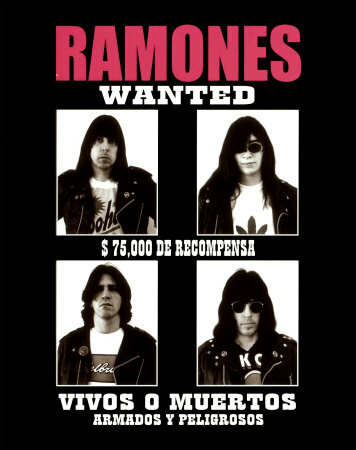 Since the RAMONES' music often seems to exist in a demented, cartoonish semi-reality, when an actual, real-life public figure makes a lyrical intrusion the effect can be momentarily disorienting. This is heightened by their wildly fluctuating taste and motives in choosing the so honoured. Certainly JOEY, after the relatively focused DO YOU REMEMBER ROCK AND ROLL RADIO, was apt to stack numerous namedrops with little regard for contextual appropriateness. Still, the roll call stands as an interesting (if hazy) barometer for the levels and circles of their fame and obsessions. The RAMONES go to the well a second time in the horror movie realm to close out the first side of their debut. TOMMY, JOHNNY and DEEDEE, with deft precision, deceptively make the seven chord, four section arrangement appear more straightforward than it actually is. If the song's uniform, blocked out structure seems a bit conservative after NOW I WANNA SNIFF SOME GLUE's nonstop unexpected curveballs, there are still subtle details to beguile. The intro and verse sections start off utilizing the same four chords--altered slightly but significantly in phrasing--and the remaining two connecting sections are variants on three note progressions in A: strummed with the the same rhythm, but completed by two different pairs of followup chords. The effect, as A returns again and again over the course of the track, never repeating the same closure, is subtly hypnotic. On top of this, JOEY delivers his most idiosyncratic vocal of the lp, which is saying something. Given merely the verses to work with (no other sections of the song have lyrics) he toys with meter and persona, momentarily adopting a faux English accent so ludicrous that the second syllable of 'basement' is swallowed up entirely, then absurdly tossing around effeminate NY putdowns such as 'daddy-o' and 'Romeo.' With brazen disregard for matching the guitars' melody and meter, he offers oddly timed--but plainly planned out- interjections of the nightmare scenario's basest emotionally minimal details. With this track the RAMONES encountered trouble, attempting to mine another sick joke out of a subject too deeply rooted in their own actual personal experience. As a result, for a long time afterwards they had to offer uncomfortable rationales and explanations when grilled about it by the press, often attempting to sidestep responsibility for endorsing such a 'ridiculous' pastime though being clearly incapable of denying having partaken. Starting off with a (relatively!) standard two chord change over the incantation of the essentially two line lyric, the song then moves on to two extremely atypical musical sections. First there is the heavy rock style accentuation of a descending progression of chords (although sonically speaking, between DEEDEE's high octave bass playing and the overall trebly mix, 'heavy' might be too generous a term.) Then later, after an already-veering-close-to-self-parody count in (this time all the way up to 8) one of the most out of place sounding passages on the lp kicks in: a tight, fluid, sinewy scaled guitar riff doubled ably by DEEDEE on bass. It stands as one of the album's only moments that even remotely resembles typical seventies hard rock, although JOHNNY omits the demo version's thrilling octave jump (see RAMONES: THE EARLY DEMOS). Destined to become one of the groups most identifiable songs, musically the track's arrangement offers a diverting amount of surprises inside of a wild 94(!) seconds. Meanwhile, the minimalist lyric and vocals established a template that would find wide adherence as the English punk explosion commenced a short time later. Kicking off with an appealing--and unfortunately unrepeated--vocal hook, the band abandons the somewhat more tempered groove of the demo (see RAMONES: THE EARLY DEMOS ) for a stronger visceral attack. The earlier recording is rooted in the much lower key of Fsharp, so the more considered tempo could simply be the result of varispeeding down a notch. After a few of JOEY's most eccentric pronunciations--on the words 'massacre' and 'there'-- the song seamlessly flips the switch from the blunt punk of the opening sections to the melodic, BEACH BOYS-influenced pop of the middle eight. JOEY's lead exhibits surprisingly imaginative nuances in phrasing as the the well arranged background vocals lend strong support, aided no doubt by another appearance of his younger brother MICKEY LEIGH, who once again makes his presence felt as this album production's secret weapon. Along with JUDY IS A PUNK, this was one of a pair of songs tried at both previous demo sessions (see RAMONES: THE EARLY DEMOS ). Undergoing perhaps more alterations than any of the others on the way to arriving at the LP version, the initial key was C, where JOEY seems clearly more confident and comfortable. Then it was brought up a step to D for the later Marty Thau demos, before finally landing in E for the album. JOEY seems to struggle minimally, but there can be little question that chorus' plea becomes more plaintive with each successive hike scaled up the neck. The BYRDS-influenced secondary guitar riff (probably played by TOMMY or JOEY's brother MICKEY LEIGH) has been reduced from the prominent role it was given in the second attempt (where clearly the intent was to amplify commercial aspects of the material) back to more or less the status of background dressing where it originated. Nonetheless, the track was earmarked as the record's second single. Charmingly embellishing the simple two part structure, the band crystallizes their first knowing attempt at utilizing base minimalism's hidden strengths. The words seek to effect the strongest possible feeling with the fewest possible phrases, this time not in a BEAT ON THE BRAT style disdain for lyrical convention, but in seeming awareness that with the perfect words chosen, expounding further was unnecessary. 'What can i say?' they self-reflexively ask, and more need not be said. 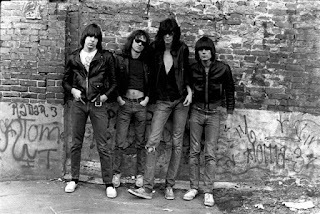 One of the most persistent terms of derision shackled to the RAMONES is the mysterious myth that they write and play songs with 'only three chords.' Qualitatively this ignores countless examples, from CHUCK BERRY's Brown Eyed Handsome Man to the BEATLES' Hey Jude, which have proven time and time again that in creating music of stunning depth and style using 'merely' three chords is far from insufficient. Materially, it might be more accurate to state that the RAMONES primarily use two barre chords (the movable E and A positions), so rarely utilizing open chords that songs where they do (such as 53RD & 3RD) are given extra demonstrative distinction. However, since they group the movable chords into multitudes of block patterns all over the neck, the songs almost always use more than 5 or 6 chords. All of this sidesteps the obvious- there are great, truly three chord classic songs (such as the TROGGS' Wild Thing) that could be mastered easily by any novice. However, the maddening patterns of waves of chords on display in RAMONES tracks such as WE'RE A HAPPY FAMILY or I WANTED EVERYTHING would prove a considerable challenge to any guitarist unaccustomed to playing in the punk idiom. As well, the BEACH BOYS influence of the backing vocals finds the band reaching even further back in time for sturdiness in pop form. Disregarding the improbability of practical application of these unlikely foundations, the RAMONES forged hit after hit for an unknowable future, top ten smashes in some alternate universe, chart toppers in a demented, close knit, secret present. 12. DO YOU WANNA DANCE? 20. 'I wanna puke'- WARTHOG and also WORM MAN! For the assertive, two note riff that opens this track THE RAMONES employ a device which they will turn to again and again on their early albums. JOHNNY, starting on the 7th fret utilizes the most primitive barre chord change possible popping 'up' from B to E- meanwhile DEEDEE, who has quirkily rooted his part on the third string of his bass jumps 'down' from a relatively high B to a lower E simultaneously. This (perhaps unplanned?) technique results in an odd dissonant tension in even the simplest of chord progressions. One of the most easily mastered of all the band's songs for beginning players, the verse section is rooted in 1-4-5 (the second in a series of four songs that open the album which share this trait) before moving to a third section of almost nursery rhyme level simplicity. The medium tempo, lurching nature of the piece shows off the production to rather poor effect. Between DEEDEE's disdain for his E string and JOHNNY's muted chords the song has hardly any low end response at all. The drums as well are so flatly recorded that an interesting repeated snare roll motif on the verse is rendered almost inconsequential. All of this, in a decade where the seamless sheen of glossy, overproduced studio trickery was the musical norm. The lyrics similarly strike brashly at accepted boundaries, repetitively staking out turf in a humor so sick that its extremity somehow flies past offensiveness to land in a sort of cartoonish absurdity. JOEY then takes things a further step, imbuing his vocal with an incongruous, almost sexual comeonish sultriness on the verse before rising to a passionate plea on the chorus. There's no telling where things might go--one part fills up the space at the end of a line with an attractive figure of 'yeahs' & 'ohs', while later a desolate measure is merely given a blase, one note reading of words like 'lose.' The results lean toward delirium. 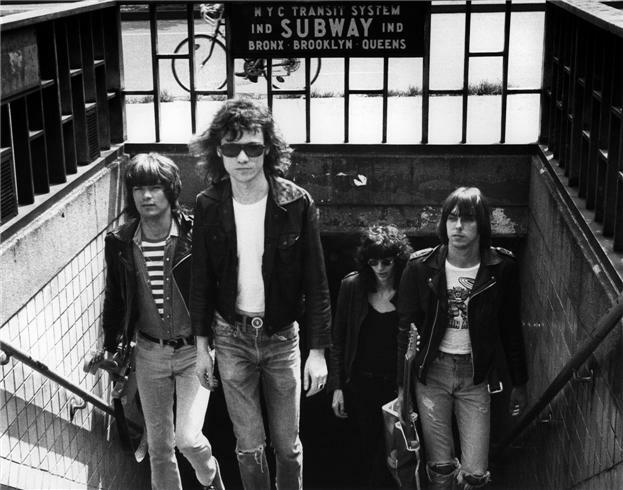 Consider then JOEY's bizarre vocal the cherry on top of a litany of oddball factors that still somehow chalk up to another distinctive, unquestionable RAMONES classic. The strength of the strange appeal of this dastardly ditty could not have been concocted by ANY other combo. Primarily written by TOMMY, the 'hey ho' sections are the result of the primitive distillation of this influence. Interestingly, they also conclude with an adding the instruments' buildup reminiscent of the BEATLES' Twist & Shout. Why Joey isn't backed by a larger chorus remains a mystery. Indeed, other than doubletracking, the vocals show little evidence of ANY production 'protection' whatsoever, making JOEY's quirky pronunciation of words like 'bop' more noticeable. The drums as well are very dryly recorded. Of course this matters little as the deliriously infectious track rolls by. Confoundingly, JOHNNY and DEEDEE marry their limited aspirations with ferocious precision throughout a well mapped out arrangement. The song's blazing music also inadvertently undercut their early notions of creating a new rock free of blues influences- the primary riff, much like La Bamba and Louie Louie, compresses the standard 1-4-5 pattern into a riff instead of a sequence of changes. (LESTER BANGS once famously bookmarked these three songs as part of a list succinctly mapping punk music's history.) They still DO make the move up to D towards the resolution in E, via a single repetition of the main riff's ADE, and in between throw in a bar of B- a move not out of place in Bessie Smith era jazz ballads (or honkytonk music for that matter.) Like the doowop derived ROCK AND ROLL HIGH SCHOOL, SHEENA IS A PUNK ROCKER or the more obvious YOU'RE GONNA KILL THAT GIRL, these kinds of progressions show that as purveyors of pop tradition they had more black influence in their music than they realized. BLITZKRIEG BOP's surprising current status as a sports arena anthem belies its content. Lyrically an ode to concert attendance, DEEDEE made small but significant alterations. By retitling the piece with an overt Nazi reference, the images of standing in line took on an unforeseen fascistic undercurrent. His other substitution further muddled their narrative loyalties- and reinforced their outsider vantage point- by suggesting that the fans should all be shot in the back. In a career full of demented humor, one of their most maliciously delicious sick jokes. An instantly recognizable RAMONES classic, BLITZKRIEG BOP witnesses the band bringing their stated dream of combining THE STOOGES with bubblegum to successful fruition, setting off a rallying cry which soon would count hundreds of new bands amongst their devoted followers. As the 70s decade sped past the midway point, the sounds of funk began the gradual transformation into the soon to be dominant disco, hippie hero leftovers of the sixties mellowed into non-aggressive California songwriter rock, and the cynically prepackaged AM radio ready production line turned instead to the strong market for glossy, slick love songs. Considering this context, the RAMONES' first record could hardly have seemed to have come more out of left field. Even the burgeoning realm of teenage rock demanded a certain LED ZEPPELIN-codified level of bloated playing ability and also a modicum of heavily mixed aural sonic power. 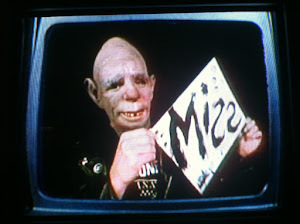 (Witness that the NEW YORK DOLLS and ALICE COOPER-influenced bombast of KISS would be routinely and absurdly ridiculed as invalid due to their wanting musicianship.) Inside this climate, their debut--stripped down with a determined primitivism, willfully applying, and almost flaunting, a near comical amateurishness--seemed so radical as to appear without precedent. That this was, in retrospect, not the case can hardly undermine the record's monumental impact. The band drew from the British Invasion's brashness, though they quickly revealed leanings to pre-BEATLES pop (I Saw Her Standing There, however, is surely an overlooked template.) The raw, simplistic power of mid sixties garage rock plus the early seventies anti-virtuosity of the STOOGES, SLADE and the already mentioned DOLLS liberated them from musically aspirational anxieties. As well, the STOOGES first record, along with the MC5's Back in the USA and the VELVET UNDERGROUND's White Light/White Heat anticipated the debut's more claustrophobic sonic terrain. The DICTATORS offered an almost parallel development of their trash culture world view. Even BLACK SABBATH and LED ZEPPELIN, acts they seemed poised as antagonistic aesthetic responses to, figured as influences. Paranoid and Communication Breakdown can hardly be doubted as probable models of tempo and rhythm. On top of all this, the RAMONES added the personality of their bizarre lyrics, forthright with stunted obsessiveness and gleefully full of twisted humor. This, not to mention their continual knack of inverting every sort of seeming personal shortcoming into bottomless wells of drawable power, endeared the group to a cult of fans that slowly swelled in numbers that eventually made their goal of widespread public acceptance immaterial- a phenomenon perhaps not noted by the band until it was too late. In early 1976 the group entered studios at Radio City Music hall with CRAIG LEON, the producer and PR man who had secured their deal with SIRE. With the not inexperienced TOMMY looking over his shoulder, the lp was completed in 17 days, at a cost of under $6500, small peanuts in 1970s record company terms. The defiant sound of no guitar solos, minimalist bass and drums, unhomogenized (and even mispronounced(!)) vocals, with absurd curveball arrangements, basing changes on barre chord patterns instead of open E, A, D or G embellishments, triggered an empathetic wave worldwide, that much is certain. But what of the way the record sounds, listening back with hindsight ears? Stylistic considerations aside, the most immediately noticeable aspect of the production is the total stereo separation of the guitar and bass- each completely confined to one channel. Early albums by the BEATLES often exhibited this trait, though the resultant benefits one might experience listening to arrangements where instruments are playing distinctively unique parts might not automatically translate in a group where often the guitars and bass are playing identical patterns. That it actually could result in sapping both instruments of overall punch and volume seems to not have occurred to anybody present. The error in judgement clearly was quickly realized, as the leadoff single BLITZKRIEG BOP was remixed so that bass and guitar are in both channels, an audibly satisfying improvement. The technique was never returned to, and the utilization of this production concept is an interesting misstep in vision from a group striving to free rock from unnecessary pretension. With the early demos now readily available for comparison, it is now less debatable that the first lp's mix might have failed to meet the potential of the material. Certainly, that LEON was impressed with the demos was a key consideration in his involvement. Why then, was not a heavier mix achieved, or attempted?? Certainly the stereo separation experiment didn't help matters, but several of the demos are rooted in lower keys, suggesting that perhaps they have been slowed a notch. Why remains unclear- experimental usage aside, the varispeeding technique typically was utilized to perk up sluggish tempos, or as might be the case here, to lower the track to a more comfortable pitch for the vocalist. Assuming this the case, the demos might have in started off closer to the sound of the record, but became heavier in tone once the time was stretched down. (Ironically the record's tonalities somewhat resemble how the demos might sound sped up.) Finally, there is no question that the band wanted to wrap up recording as quickly as possible. With the trademark barrage of the group's sound, encountering misleading playback, or meeting confusion in the mastering process would have been far from inconceivable. In the end, such idiosyncrasies and weaknesses matter very little, for conceptually the record succeeded as the RAMONES succeeded, improbably turning odd quirks into celebratory badges. Consider details such as the gallingly unglamorous cover shot (imagine ROCKET TO RUSSIA's cover more what they were aiming for) or the startling back cover cataloging of numerous song lengths under two minutes, or the ridiculous utilization of groovy 70's inner sleeve lettering for lyrics such as the 19 word LOUDMOUTH, or the endless repetitions of the word 'WANNA.' Just like the mid sixties ROLLING STONES' zitty KEITH RICHARDS photos, they all subconsciously communicated to their followers what the band would soon make concrete:We Accept You. One of Us. 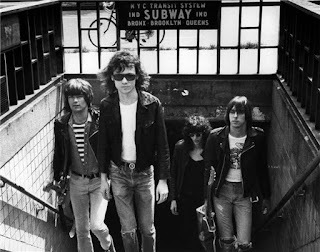 And with the bulk of the next album's material written, the RAMONES raged ahead, dusting off the rookie lessons of their debut- but leaving us all reveling then, and forever, in the lunatic fuzzball of its imperfect perfection. THE RAMONES, hoping to aid the securing of a record deal, made many demo recordings of their early material. Mostly recorded in the first part of 1975 (some sources even state late 1974) with a second, shorter attempt in September, these offer the best glimpses of the band in its formative stages. (Two notable films also exist from this period- a three song shambles of a 9/15/1974 performance featuring an eerily childike RAMONES at an astonishingly early CBGB show, and a powerfully raw, but still not quite fully developed setlong video shot at ARTURO VEGA's loft in March of 1975, basically halfway between the demo sessions.) Utilizing the 914 recording studios, Tommy Ramone's previous engineering experience, and the peripheral input of first manager MARTY THAU, they offer a fascinating alternative insight into how the eventual debut album might have otherwise sounded. Their dense, primal sound reveals the surprising amount of dilution that the first record's somewhat conceptual mix wrought upon the quartet's fundamental power. That so many songs are not in their final keys also brings into question the possible use of varispeeding. What purpose might be served by slowing the demo recordings down to these keys is unclear- and overall the tempos seem in line with how fast they were at this point, so for the present the assumption will be made that their playing has not been tampered with in speed. (Altering, for instance, JUDY IS A PUNK merely an exact half step away from the true tempo would create negligible result at considerable effort.) More on this technique later. The bulk of the album's worth of demos were laid down at the earlier session. The songs were almost evenly divided between material headed for inclusion on the debut, and the remainder saved for the following lps or discarded in favor of other newer compositions. At the later September session they made second, more polished attempts at what were apparently regarded as their two most commercial songs: JUDY IS A PUNK and I WANNA BE YOUR BOYFRIEND. These two, as well as five from the previous attempt, appear as extras to the extended CD edition of the first album and thus will be given consideration later in their proper spot. This section concludes with a link to a companion piece about these crucial, overlooked recordings, along with accompanying samples. The first attempt at one of their most durable classics kicks off surprisingly in plain D (by the time of the second attempt in September the mystifying shift to its final key of Eflat has been cemented, an extremely uncommon starting point for guitarists, but less surprising when the RAMONES' tendency to construct songs as blocklike patterns of barre chords is considered.) DEEDDEE's background vocals display a more distinctive (and, ironically, perhaps more commercial) melody than what was later settled on, and are mixed thrillingly high. Like many of these demos, the overall sound suggests that the heavier, thicker-but still catchy sound of their second lp LEAVE HOME was closer to the aural aesthetic being aimed for than the debut. Their first ballad oddly escalates in key with each recording attempt. For this try they start in C, then climb to D in September, then finally settling in E for the lp. Perhaps not the wisest move- JOEY's vocal is far more relaxed and expressive here, although there is something to be said for the 'pleading' affect on his voice as he reaches in the higher keys later. With the BYRDS/SEARCHERS influenced secondary guitar riff, note should be made of the first overdub in the RAMONES recordings unlikely to be replicated in live performance. Taken at a somewhat less frantic pace than the lp, which somehow augments the potency of the song's demented bubblegum.This effect is also shaded by the more menacing key of Fsharp, as opposed to the lp's more easily organized A pattern (Perhaps the band's favorite key?) No buzzsaw intro, but a prime example of the group's bizarre groove. Once again, rooting the song in the lower key of D (E on the lp) gives a less strained JOEY opportunity to inject the vocal with extra gusto, while JOHNNY and TOMMY chug along at a slightly slower speed. A step lower in key (natch) but otherwise quite close to the eventual performance. Perhaps amongst this group the likeliest proof of varispeeding, with D featuring the telling low end rumble associated with this song's true key: open E, this is an otherwise impressively assertive band performace, with DEEDEE's vocals and TOMMY's drumming given greater prominence. Apparently the tune which first courted interest from their soon to be label SIRE, who offered a single deal for this song- an offer which the band resisted, holding out for an album contract. Surprising, then, that this track (in the true key, by the way!) was one of the two demos left off the first record in favor of the second, then only to be mixed down so weakly on LEAVE HOME that using it for a single became unlikely. Fortunately, this crunchy, energetic take remains- complete with JOHNNY not yet bothering to lower the volume of his guitar for the quiet passages. This pulverizing take (down a step to D) features some surprising bass embellishments from DEEDEE standing out from an overwhelmingly and confidently powerful performance of what was, at this point, one of their oldest songs. Featuring the uncensored, unapologetic original lyric, later altered at the behest of SIRE head SEYMOUR STEIN (although what exactly makes stating that one is a Nazi "baby" demonstrably more objectionable than stating that one is a Nazi "schatze" remains murky) this very, VERY early take displays the band already in considerable command of the beguiling power of their willfully precise primitivism. Varispeeded? Probably. Killer? Definitely. This early JOEY demo would be held back until LEAVE HOME. Some of the background vocals and guitar trills are absent, but otherwise this take is extrememly similar to the final official rendition. Are those some guitar fills from JOHNNY almost audible on the instrumental break? As stated before, the rest of these recordings will get their due as we reach their appearances on CDs. Below is a link to a blog where all of these demos can be heard.